We specialize in Archery training and classes of both youth and adults of all ages..
We have an indoor 3D target and 40-yard bale range. 10112 Toebben Drive Independence, Kentucky. Our telephone number is 859-282-6333. I discovered soon after that there had to be a better way to service a customer than that experience. Knowing that I will retire soon I decided to open the only professional, and family friendly indoor Archery Pro-Shop and Training center in the area. The name M&M Archery is named after my son and myself. So don't be surprised to find my son and my two daughters along side my wife working behind the counter to assist you with products or training. They have been involved with archery since the early age of four. We are authorized retailers with only the finest companies which are Mathews Archery, Mission Archery, Genesis Archery , Bear Archery and Obsession. We pride ourselves in personally testing each and every product in our store. If we carry it, we know it and would use it ourselves. Every product we carry is special because we put our name on it and we take that very seriously. We stay on the cutting edge of new archery technology and often attend product demos and trainings. We review and field test in a genuine effort to provide you only the absolute best! M&M Archery Range is very proud to be associated with the ATA Archery Trade association, ﻿﻿USA Archery, National Archery in Schools program (NASP), Explore Bowhunting, and both USA Archery Adult and Junior Olympic Archery.﻿ ﻿ We want to bring this great opportunity to our local youths and our community. Here with us you are much more than a customer you are friends. We at M&M Archery Range feel our youths are the most valuable investment we can make in preserving the great sport of archery and the future of hunting. ​It is equally important to preserve enjoyment in the great outdoors, so that is why we are proud to be the only family friendly Archery shop and training center in the area. We also are very active on our ﻿Facebook ﻿and Twitter pages. Follow us for updates, information and opportunities. Meet the owners Left to right Caleb, Hannah, Brianna, Krysta and Mel Wright. Meet the owners and customer service team for M&M Archery. From left to right Hannah, Melvin (Caleb), Brianna, Krysta and Melvin. Our favorite time of year early fall. Bow Technician and Owner of M&M Archery range LLC. Also known as the "Bow Doc", I grew up in Northern Kentucky and have been involved in Archery for over 35-years. My family and I enjoy hunting so much that we began out of the basement of our home more than 20 years ago, and since then have grown our business. ​We have several hunting traditions that have been passed down from generation to generation for hundreds of years. I have been Field Producer for hunting shows, but have worked on several projects with Divine Outdoors Productions (A weekly hunting and outdoor show) as well as a Pro-Staff team member for Bear Archery, Wac'em Broadheads, and Victory Archery. I have been working on and repairing bows for over 25 years, and specialize in the technical side of bow tuning getting the most out of your bow in the categories of Speed and Silence. and have certification as an Archery Technician and specialize from complete repair to a simple limb and Cam change. One of my favorite activities is coaching Archery for both new and experienced archers. 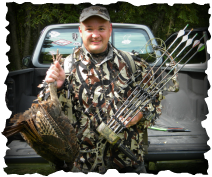 KDFW (Kentucky Department of Fish and Wildlife) Bowhunters Education instructor and hunting mentor. I am an Avid bow hunter that fuels my passion for the Outdoors, and also make custom game calls that are for sale in the store.